This 16 track album has been available in digital form since March 30th on platforms like Bandcamp, iTunes, Amazon, Spotify, etc. The tracks are a collection of old and new tunes inspired by God's leading me over the years, from California to Germany, to the people I've met, even to bringing me my wife. 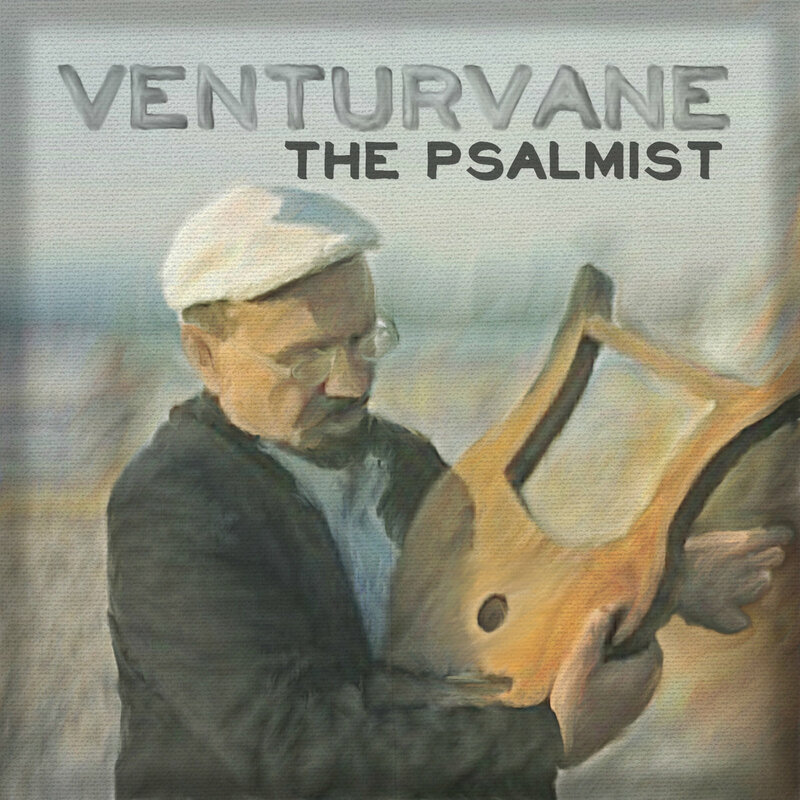 "Venturvane" comes from the instrumental guitar piece "Holy Spirit Venturvane" (also available on the album) that I wrote back in 2005 before and during my first trip to Germany. The piece in itself was a self portrait of the anticipation and excitement of the unknown that was coming ahead back then with the whole trip and where God would lead me once I was here and thereafter. "Ventur" comes from "Adventure" and "Vane" comes from "Weathervane". So, like a weathervane, this "Venturvane" is, to me, like God's tool to steer and guide me along the path that He has in store. His Spirit is like the wind that makes it turn. There's an exclusive Bandcamp-only bonus track that isn't available anywhere else on the web and also not on the CD. So, when you download the album there digitally or even when you buy the cd, which comes with an immediate download of the digital album, you'll get this special little gem. Although I did edit it a bit to make it consumer quality, I wanted this bonus track to not have a big production sound like the rest of the album, but rather capture the atmosphere and innocence of what it's like to just be in a sanctuary hall of a church, singing a praise song to the Lord. My wonderful wife joined me with her background vocals. So, it's just us, a guitar and God, as we are, coming to worship. A quiet and calm ending to this adventurous album (no pun intended :-). The Psalms of the Hebrew Bible have been a wonderful source of inspiration and guidance since their creation. Largely composed by King David, they were songs written to express many topics ranging from God's goodness to the emotional conflicts of the human soul. "The Psalmist" will be an ongoing project with the goal to musically and lyrically capture the beauty and simplicity of these psalms, ultimately making them available for free use in every household around the world. As often as possible, each Psalm will be posted on my Bandcamp, NoiseTrade and Soundcloud pages until all 150 are collected. They are free of charge. But, if you feel like contributing toward the project, then feel free to give as much as you like. I've decided to start a small home-studio mixing and mastering business. So, if you're a musician or in a band that has a single or some tracks that you'd love to make an album out of, then check out all the meat and bones of what that's all about right here. I'll try not to send out updates too often, since I know how it is to get lots of emails every day. But if you're on social networks, then those are great ways to keep up more regularly on what I'm up to. There's a link to any of my social network pages when you go to my website at www.venturvane.com. Of course I ask that you share the music legally. That means, please don't burn copies of it and give it away. Only "The Psalmist" is okay to copy, burn and multiply as much as you want. But the rest, please share it within the ways that are available to do so. For all you guitar junkies out there. Here's a list of the tunings and capo settings I used on my guitar on the Album. Have fun trying them out. I always found it fun to sample new tunings and try and learn my favorite tunes by ear with them. Slowly, but surely, MY FIRST STUDIO ALBUM is coming together!!! All the demos you've heard on my soundcloud page, along with a cover version of “How He Loves,” by John Mark McMillan and a couple recently unreleased tunes of mine, are all systematically being refined. All the tracks that will be on the album have been recorded as a demo. Half of them so far have been thoroughly refurbished to what is now the first draft of their “mixdown.” As soon as the rest are finished going through my refining job to the first draft of the mixdown phase, I'll go back 1-2 more times to tweak little things that still don't quite sit well. And after that finally comes the phase where they all get “mastered”. Then comes the production phase followed by the BIG RELEASE DATE (to be announced). And just because I like you all so much and the sun is shining today, I'll make you a special offer. Below is a sneak peak of the track listing. But to not spoil everything, I won't reveal the introduction and filler track titles. For those of you who have known me longer and heard many of my other tunes live or back when several were on myspace, you're probably wondering why I don't have more of my tunes on this first album. I actually considered having all of my tunes so far on one album, but realized that it's just too much and will take so much longer to release because of all the recording still necessary. So, I realized I could just spread them all out over 3 albums. So, after this first one, you can definitely expect at least 2 sequals over the next couple years. Several months ago, I doodled a little sketch in church based on the sermon. The preacher was Italian and emphasized how in the Italian translation of Colossians 3:15, it is translated as "president of our hearts". Very encouraging scripture to remind us to let Christ's peace take rule over our hearts. Sometimes we can get into pretty frustrating situations, or become worried to the point that it makes us sick. But, when we have His peace in our hearts, we find that all our worries are not worth worrying about. In the past few years, I've written songs/compositions as gifts for one or the other occasion. This recently inspired me to create a postcard, with which one can present someone special with an unforgetable gift in an extra special way. In den letzten Jahren habe ich Lieder/Kompositionen als Geschenk für den einen oder den anderen Anlass geschrieben. Dies hat mich neulich inspiriert, eine Postkarte zu entwerfen, womit man in einer besonderen Art und Weise jemanden ein unvergessliches Geschenk machen kann. My Aunt recently forwarded me an email with comments from a friend of hers regarding my music he listened to through my MySpace page. He is also a musician and I was delighted to receive his insights, each of which I then responded to. He's kindly allowed me to post our conversation here, as I thought it would bring some insite into the pieces that I wrote and some of their background and history, which some may not know about. Gordon wrote on July 6, 2011. I then responded on July 9. His final response, which he wrote on July 10, is included at the very bottom of this blog. [Gordon] He has a diversity of styles from ambient airy jazz (think ECM a norwegian label) to Philip Glass (techno loop style) to live performance and vocals on some songs. Definitely, a lot to cover, it is done well (compositions/voice), and very european in favor. [Daniel] Cool that you think of ECM or Philip Glass when you listen to my tunes. I would say that John Adams (composer, not the president :-) ) and Pat Metheney are my two most favorites and biggest influences. [Gordon] HS Venturvane - (1st version) this was a Philip Glass meets ELP techno version which I felt was better than that live version (2nd version) which was hard to hear, especially the interplay between the instruments, the first version with the keyboard was better than the second live version, and it was probably the recording not the composition or performance. [Daniel] This piece was actually written back in 2005 for solo guitar. So the guitar version is the original and the Techno version just for fun. I've never managed to make a nice recording of the piece other than the one that is from that live concert. The title is actually "Holy Spirit Venturvane." I had to shorten it for MySpace unfortunately. Did you think there were two guitarists playing it? It's actually just me. It was heavily inspired by John Adams, not just in the minimalist aspect, but the developmental and tension/release and large structure aspect. The piece is a personal one actually that tells about how God lead me to Germany and is in four sections: I. West Valley II. 85 South III. 101 North IV. "Second star to the right and straight on 'til morning"- Peter Pan. The name "Venturvane" is my own creation and comes from the words "adventure" and "weather vane." A weather vane shows us which way the wind is going and coming from. But a venturvane shows us which way God is leading us towards adventure. And the Holy Spirit is like the wind he uses to steer the vane. "West Valley" was the name of the college I went to and studied music at before I then came to Germany. 85 headed south and 101 headed north were the highway stretches I would take from my college to get back home. So you see the pattern with West, South, North and therefore expect something with East, like East San José, where I grew up. But of course, God always leads us in unexpected ways to adventure. So he shot me off to Germany. Therefore, I chose to title the last section after Peter Pan's famous quote, because that's the way he went to get to "Neverland." So, the titles are all metaphorical in a sense and help the listener feel like they're traveling or going to take a ride. The Techno version came about when I was fiddling with the notation of the piece on a program called Logic on a Mac computer. I could play back the notation with different sound effects, like a Steinway Grand piano or a guitar. So I also found this cool techno-like sound. And since the playback quality was so good, I exported an MP3 copy of the piano and techno versions and then mixed them together. It's funny you like the techno version better. Some folks don't like it so much. You can see a little clip of me performing the piece in the video section of my MySpace page. The video is called "Eine Kleine Nachtmusik." It's just a clip because I sell the full version as a DVD. Unfortunately I can't get it to upload to lulu.com where I sell all my other stuff. So, I'll have to try a different route. [Gordon] Petite Marmotte - Definitely the best recorded, was a sweet soothing Acoustic piano piece, his best composition (right now) I feel. This one was mentioned in the news article. [Daniel] This piece is actually one of my favorites, and my wife's too. Because I wrote it as I was getting to know her. You read the article about it and know why it was written. I actually wrote a blog about the development of the piece, which you can also read on my website. It's titled "Back to the drawing board for the umpteenth time: A look behind the creation of 'Petite Marmotte.'" The recording was made on a Roland Electric Keyboard in Herrnhut where I lived. It was in the sanctuary hall of the church I attended. I liked the acoustics in there because it made the keyboard sound good. Otherwise, I would have recorded it on an acoustic piano. [Gordon] All that I am, All that I have - Sax too loud, too up front, rest of group washed out, so this live piece worked, but it was just the recording and balance. [Daniel] This piece was written for family member's wedding back in 2009. The title of this one is also longer and had to be shortened for the MySpace music player: "All that I am, all that I have been, I offer now to you." The title, which is the main chorus line, comes directly from the text on their wedding invitation. The first verse is from Jeremiah 29:11 in the Bible. The second verse comes from Romans 8:28. The Pre-chorus is derived from Proverbs 16:3 and 1st Corinthians 13:4,8. The only text that I wrote myself was the "Take this vow into your heart and never let it go." part. The sax is too loud in the recording, unfortunately. But it's the best recording I have of the piece at the moment. It was recorded with the sax player's iPhone, which has a pretty good microphone for such a gadget like that. I figured I'd try to make a CD of the best live recordings I have and save up with the sales of that CD to make a good recording one day. Several bands have done that before that I know of. Their first album is usually a live album. [Gordon] 3 impressions from Abroad - Interesting and enjoyable piece, 3 movements (like the faded bride suite), maybe better representation of what each movement represented, was it a country, was it a river, was it a comparison of US . . . San Jose/Germany, this would help the listener grasp which impression we're reflecting and focusing on. [Daniel] This one is actually titled, "Three Impressions from Aboard the U.S.S. Blaisdell." I. Christening II. Ævélo The Whale III. Goodbye To Romance Upon Our Journey's End. Most of my pieces have a story behind them. But this one has a story that's make believe. The U.S.S. Blaisdell is a submarine on display in Juneau, Alaska. Its christening in 1955 was a milestone in history, for this new class of submarine was to be the flagship of the U.S. Naval Submarine Fleet. Its commission spanned nearly 50 years with several crews. The christening brought much excitement and angst to its first crew as they looked forward to the adventures that were to come. One of the crews assigned to the submarine had quite a character of a chef in the mess hall. The sub was in its second decade when it had an encounter for several months with a curious whale. The chef, Ævélo, spent much of his free time watching this whale and singing to himself in a mock whale-song. This behavior went on long before the whale had arrived and long after its disappearance. The captain and crew, from the whale's departure onward, nicknamed the chef, Ævélo the Whale. Finally, when the sub had reached the day of its decommissioning, all the crews from over the years had a celebration to give their final farewells to the submarine and all the memories that came from the long years of adventure. Like "Holy Spirit Venturvane," it also has a sort of interwoven, metaphoric aspect to it. I wrote this piece back in College in 2004 and told the story before I performed it. But I didn't tell anyone whether it was true or make believe. So most folks thought it was true. But some asked me later and I then told them :-) I was inspired to write it while thinking of the Fantasia 2000 movie that I had seen a few years earlier in San Francisco at a huge Imax theatre. The one particular part of the film which came to mind was that with the whales. The music was "Pines of Rome" by Ottorino Respighi, which stayed in the back of my mind as I looked for inspiration to write the piece. It was just the way the music depicted the majestic and endless breadth and depth of the ocean and how vast it is in comparison to us. And the gentle and mysteriousness of the whale swimming around in the ocean was almost like the spirit of the sea, speechless and yet there so graceful and gentle. I wanted to depict this in my piece. The dissonant and ominous chord that appears in each movement reflects this most for me. The middle section of the piece with the cook and his behavior before and after the whale's appearance reminds me a bit of Brother Lawrence, whose writings were collected to form the book The Practice of the Presence of God. He wrote, "The time of business does not with me differ from the time of prayer, and in the noise and clatter of my kitchen ... I possess God in as great tranquility as if I were upon my knees at the blessed sacrament." Brother Lawrence himself also worked in a kitchen. He tried to behave as if God were with him at every moment, like a close friend. So, the "Ævélo" character in my piece can be seen as Brother Lawrence who is worshiping God, though he may not see him. The whale he encounters is therefore like God's Spirit that comes and encounters him in the physical for a time. The funny thing is that I didn't intend this relation to Brother Lawrence in the piece when I wrote it or when I wrote the story of the chef and all. But I began to see the similarities that it could depict as I played it again and again. The first movement of the piece was a bit inspired by the introduction of Igor Stravinsky's "Petrushka" ballet with it's depiction of the hectic hustle and bustle of the Russian Shrovetide fair. In my mind though, I picture what is described in the story from "Three Impressions from Aboard the U.S.S. Blaisdell". [Gordon] You are - the standout here is the flute interplay, very well done! [Daniel] "You Are" was also written for a wedding back in July of 2009. The scripture that came to mind was that of Psalm 139 in the bible about no matter where we are, God is there. For example, Psalm 139:8 reads, "If I go up to the heavens, you are there; if I make my bed in the depths, you are there." I wanted the song to be like a praise to God, claiming who he is, was and will always be. And the statement God made before Moses, when he saw the burning bush, that "I Am" was his name, came to mind. God is endless, he never had a beginning, and will never have an end. The part in the song after the flute solo is a picture of the anticipation of the wedding and celebration thereof. Take hold of my hand, Lord. Guide me to that secret place. That place where you took me that one time before. The place filled with laughter, rejoicing and praise. All for the bridegroom awaiting his day to wed his beloved. His crown jewel, adorned in fine linens, sapphires and rubies. This is the text of that part, and it speaks for itself. As for the music, it all began one morning when I went to the Watchtower of God's Acre in Herrnhut with my guitar and just felt like I should play for God. The chords and melodies came to me and I later used them for this song. Thank You so very much for your wonderful response on your music. It was very enlightening to hear how these tunes came together, from their motivational points, as well as, their purpose, origins of and to completion, to performance, to enjoyment for others. This is what "our gift from God" allows and provides us to share "this talent we have" or as you have put it "All that I am, All that I have" with all. It is the never ending journey, for it adds clarity and vision of this art form for it is "our joy". Much continued success on this journey, for there is much music to write and many ears to hear and listen. Here I offer some historical insights on some of my comments to your music. The ECM mention was a direct connection to John Adams, for Steve Reich, Philip Glass, Terry Riley (all artists on ECM) were some of Adams early influences of minimalism, when he worked at the San Francisco Conservatory of Music in the Electronic Music Studio. I guess now you can understand why I did like and mention ECM and the techno piece. I would also recommend Meredith Monk, Brian Eno and Robert Fripp, the work of Fripptronics, Pat Metheny's X album, and Ornette Coleman, James Blood Ulmer for continuing ideas that might inspire. Some of these artist's ideas are more commercial/ less commercial, so it is merely mentioned as reference points. I did give another listen to the solo guitar [version of "Holy Spirit Venturvane"], and then heard the picking style you were using and the lower detune of the bass strings on the guitar, but I found it more akin to what Michael Hedges, William Ackerman, and Alex De Grassi artists on the Windham Hill label are doing. So now I understand not two guitars, but one, and understand the Pat Metheny influence. Also like to compliment on the use of bell harmonics nice placement, well executed, very Lenny Breau. Wie kann man ein Lied komponieren? Ich wurde schon mal gefragt, wie ich meine Lieder schreibe. Schreibe ich den Text zuerst? Fange ich mit der Musik an? Es ist immer unterschiedlich. Vielleicht kann ich aber einen Einblick oder etwas Inspiration an allen geben, die sich für sowas interessieren. Daher stelle ich folgendes Projekt zum Lied-komponieren rein, welches ich vor ein Paar Jahren entwickelt hatte. Als ich damit anfing, die Grundlagen der Musiklehre zu unterrichten, stellte ich fest, dass es nötig war, ein Ziel vor den Augen der Schülern und Schülerinnen zu geben. Es fehlte ein Endprodukt, worauf alles sich hinrichtete, was sie lernten. Deshalb dachte ich mir: „Warum doch nicht allen den Auftrag geben, ein eigenes Lied im Laufe des Kurses zu komponieren.“ Also saß ich mich hin und schrieb alles genau auf, was mir als die beste Erklärung einfiel, um ein Lied zu komponieren. Nun wünsche ich euch viel Spaß beim eigenen Lied schreiben. Beachtet bitte nur folgendes: Dies ist nicht eine Einleitung, welche es eins und für alle Mal erklärt, wie man ein Lied auskomponiert. Die Reihenfolge der Schritte habe ich nur so ausgewählt, denn es am Besten zu den Schritten der musikalischen Grundlagen passte, die ich unterrichtete. Daher dürft ihr die Schritte in der Reihenfolge machen, sowie ihr möchtet. Bis zum letzten Unterrichtstag sollte jeder/e Student/in zum mindesten ein Lied vorbereitet haben, das im Form von einem "Leadsheet" ist. Bei einem typischen Leadsheet gibt es nur eine Notenlinie, einen Violinschlüssel, ein Tonartvorzeichen, eine Taktangabe, eine Tempoangabe, eine ausgeschriebene Melodie – manchmal gibt es Liedtexte dazu – und Akkordsymbole, die die gewünschte Harmonien angeben. Das Leadsheet gibt dem Ausführenden eine Idee, was der Komponist für eine Melodie und für Harmonien möchte, vielleicht auch was für einen spezifischen Stil erwünscht sei. Aber genau wie der Ausführende diese Harmonien zusammen mit der Melodie spielt, und auch wie er selbst die Melodie spielt, ergibt sich je nach seiner Kreativität. 1. Liedtext: Denk dir einen Liedtext aus und schreib ihn auf. Den Text erstmal auf einem leeren Papierstück aufschreiben. Dann auf Papier mit Notenlinien aufschreiben. (Vergewissere dich, dass du genügend Platz am Anfang des ersten Notenliniensystems lässt, damit der Notenschlüssel, der Tonartvorzeichen und die Taktangabe alle passen. Lass auch Platz am Anfang jedes folgenden Systems, nur damit der Schlüssel und der Tonartvorzeichen passen.) Die Form des Liedes darf sein, sowie du willst. Zum Beispiel: Intro, Strophe 1, Refrain, Strophe 2, Refrain, Bridge, Refrain, Outro. Es ist jetzt erstmal o.k., wenn jedes einzelne System bis zum Ende mit Text gefüllt wird. Zum Beispiel: Die Strophe muss nicht auf einem neuen System anfangen, wenn da noch platz auf dem System ist, bei dem das Intro aufgehört hatte. 2. Zeit: Entscheide dich was für eine Taktart und ein Tempo du möchtest. Zeichne dann auf dem Ersten System eine dazu passende Taktangabe, sowie in dem Beispiel oben. Lass aber Platz zwischen dem Schlüssel und der Taktangabe, damit der Tonartvorzeichen dazwischen hineinpasst, welcher noch kommt. Lies dir deinen Text laut vor, je nach deiner Taktart. Während du das machst, markiere in den Text wo die Takten aufgeteilt werden. Achte auf irgendwelche Zeitlücken zwischen Wörter in dem Text, die länger als ein Takt sind, und bezeichne diese Lücken mit leeren Takten. Entscheide dich auch, ob du Auftakte an bestimmten Stellen in der Musik oder in dem Text möchtest. Es ist jetzt erstmal kein Problem, wenn ein Takt nicht unbedingt bei einem Systemende aufhört, sondern beim nächsten System. Ein Einzelstrich ( | ) teilt einzelne Takte auf und der Doppelstrich ( || ) teilt eines Absatzes Ende vom Beginn des nächsten Absatzes auf: Ein Absatz ist zum Beispiel dein Intro oder deine Strophe, etc..
3. Melodie: Denk dir nun eine passende Melodie zu deinen Liedtext aus und entscheide dich welcher Tonartvorzeichen zu deiner Melodie am Besten passt, je nachdem wie deine Melodie Dur oder Moll entspricht. Zeichne dann diesen Tonartvorzeichen zwischen den Schlüssel und die Taktangabe hin. Wenn du ein Intro, Outro oder sonst ein Teil ohne Text in deiner Musik hast, dann denk dir auch eine Melodie dazu aus. Da du deinen Liedtext schon auf das Notenlinienpapier aufgeschrieben hast, sollst du erstmal diese Stellen, die ohne Text sind, mit Fußnoten markieren, und sie dann erst am Ende des ganzen Textes ausnotieren. Einfach mit Notenköpfen – noch keine Notenwerte auskomponieren – die einzelne Töne deiner Melodie über jede einzelne Textsilbe drüber ausnotieren. (Wenn es sich 2 oder mehrere Töne über einer Silbe erscheinen, – dies heißt: Melisma – dann binde solche Töne mit einem Bindebogen). Wenn es irgendwo ein Teil des Liedtextes länger ausgesungen wird, als es in einem Takt passt, dann notiere den zugehörigen Ton am Ende des Taktes und noch mal am Anfang des nächsten Taktes. Binde die zwei Töne letztendlich mit einem Haltebogen zusammen. Mach das weiter so, falls der Ton über mehrere Takte ausgehalten wird. 4. Harmonie: Je nach deiner Melodie, denke welche Harmonien aus und bezeichne sie mit Akkordsymbole direkt über die Noten drüber. Das Akkordsymbol sollte direkt und deutlich über der Note liegen, bei welcher es erst gespielt wird. Stell dir fest, dass die Töne deiner Melodie, die zu dem Harmonie gehörig sind, vollständig das repräsentieren, was das Akkordsymbol eigentlich bezeichnet. Harmoniefremde Töne sollen nicht teil der Akkordsymbol sein. 5. Notenwerte: Entscheide dich letztendlich, was für Notenwerte jede Note in deinem Lied bekommt. Achte darauf, was für eine Taktart deine Taktangabe fördert und ob es irgendwelche Töne gibt, die über einen oder mehreren Taktstrichen ausgehalten werden. Wegen dem musst du jetzt viele deiner Wörter löschen und umbauen. In den Wörtern, die mehrere Silben haben, muss jede einzelne Silbe mit einem Strich von der nächste Silbe getrennt werden. Zum Beispiel: das Wort "Notenwerte" wird jetzt zu "Not-en-wer-te." Die Silbe nur am ende eines Wortes – sowie auch Wörter, die nur eine Silbe haben – die entweder melismatisch sind oder einfach länger als ihr buchstabiertes Aussehen gesungen werden, bekommen einen Unterstrich, der bis dahin geht, wo diese Silbe nicht mehr gesungen wird. Zum Beispiel: "Ich liebe das singen!" mag so werden wie "Ich____ lie - - - - be das Sing-en!_____ ". Ein Satzzeichen kommt nicht erst nach einen Unterstrich hin, sondern direkt nach sein gehöriges Wort hin. How can you write a song? Some have asked me before how I write my songs. Do I write the lyrics first? Do I start with the music? It has always varied. But maybe to give some insight and to inspire anyone whose fancy is tickled, I've decided to post this song writing project that I came up with a couple years ago. When I first started teaching basic music theory, I found the necessity for some kind of a goal in mind for the students to have. There was an end product that they were missing with learning all the stuff. So, I thought to myself, "Why not have them write a song over the course of the class?" And after sitting down and meticulously writing down what I felt to be the best way to explain a way to write a song, this is what I came up with. So, have lots of fun writing your own songs. Take into consideration though that this is not the one and only way to compose a song. I chose to go in the order that you see here because it fit well with the order I followed in teaching the various components of music. You may go in any order you like. By the last day of music theory class, each student shall have prepared at least one song in the format of a "lead sheet." A lead sheet typically uses one staff with a treble clef, a key signature, time signature, tempo indication, a notated melody – sometimes with lyrics – and chord symbols where desired to indicate the harmonies. The lead sheet provides the performer with an idea of what the composer desires in the melody and harmonies, maybe even a specific style. However, exactly how the performer plays those harmonies along with the melody, and even the melody itself, are up to the performer's creativity. 1. Lyrics: Come up with some lyrics and write them down; first write them on a separate piece of blank paper and then onto lined music paper. (Make sure to leave room at the beginning of the first staff system for the clef, key signature and time signature; leave room at the beginning of all the remaining systems for the clef and key signature) The song can follow any form you like; for example: Intro, Verse 1, Chorus, Verse 2, Chorus, Bridge, Chorus, Ending. It is o.k. for now if each individual system is filled to the end with text. For example: the Verse doesn't have to start on a new system when there is still some room left by the time the Intro is finished. 2. Time: Decide what Meter and Tempo you would like for your song and place an appropriate time signature onto the first staff as in the example above. Leave room between the clef and the time signature though for the key signature that will come in between the two. Recite through your lyrics in the Meter that you will use and mark off in the lyrics where the measures will be separated. Take into consideration any gaps of time between lyrics and designate these with empty measures. Also consider if you want "pick-ups" at particular points in the music or text. It's not a problem for now if a measure doesn't necessarily finish right at the end of a system and it finishes instead in the next system. A single barline ( | ) separates individual measures and a double barline ( || ) separates a section's end from the next section's beginning. A section is, for example, the Intro, Verse, etc..
3. Melody: Now, come up with a melody to fit with your lyrics and decide what key signature fits to your melody best, based upon whether your melody exhibits the major or minor mode. Place then that key signature between the clef and the time signature. If you have an Intro and/ or an Ending, or any part without lyrics, then come up with a melody for that as well. Since you have written your lyrics onto the music staff already, mark off with footnotes where these non lyrical parts will take place and notate these parts after where the lyrics end. Simply with note heads, – no rhythmic value yet – write out the individual pitches of the melody above each syllable (if 2 or more pitches appear over one syllable, – this is called a Melisma – then connect those pitches with one slur). If any lyrics are sung for longer than will fit in a measure, then notate the given pitch at the end of the measure being left and in the new measure and connect them with a tie. Continue this if the note continues over several measures. 4. Harmony: Based upon your melody, come up with harmonies and label them with chord symbols directly above the notes; each chord symbol should come directly above the note at which it is first played. Make sure the harmonic tones in your melody are fully represented by their given chord symbols. Non harmonic tones should not be part of the chord symbol. 5. Rhythmic Values: Finally, decide upon rhythmic values for each note in your song. Take into consideration what Meter your time signature conveys and whether there are any pitches carried over one or more barlines. This will cause you now to have to erase and reconstruct many of your words with more than one syllable. In words that have more than 1 syllable, each individual syllable must be separated by a dash from the next syllable. For example: the words, "rhythmic value" will become "rhyth-mic val-ue." The syllable only at the end of a word – as well as single syllable words – affected by melisma or simply held out for longer than the span of their written appearance receive an underscore spanning to wherever that syllable or one syllable word is no longer intoned. For example: "I really love to sing!" may become "I real- - - - ly______ love______ to sing!_____ ". A punctuation mark does not come after the underscore, but rather directly at the end of its respective word. Back to the drawing board for the umpteenth time: A look behind the creation of "Petite Marmotte." Have you ever worked long, hard and passionately on a project to meet a deadline, only to have become so frustrated as one of the following statements began to run through your mind: “It's not good enough.”; “It's not what the person wanted.”; or “It doesn't meet the specifications asked for”? Well, I have. It's those kind of thoughts that make you up and decide to scrap it all – or in my case, to save it for another project – and “go back to the drawing board.” Recently, a good friend and former piano student of mine, Nelly, asked me if I would compose a piano piece for her, for which she chose the title, Petite Marmotte. It was to be a gift from her to her boyfriend, Jim, who was to return home after over half a year away in military service overseas. I was of course flattered to even receive this request, not just because it was my first paid commission, but because it was to have great sentimental value. It was to express the sadness and patience – “long suffering,” as I like to call it and as the King James Bible so poetically translates it – that one goes through when missing a loved one who is far away for a long period of time and yet have a joyous ending to express the excitement and jubilation upon their long awaited return. I already had experience by then in writing pieces for special and meaningful occasions, as I had written one piece for a friend's wedding in July of 2009, titled You Are, and one for a family wedding in September of that same year, titled All that I am, all that I have been, I offer now to you. And I guess I could say that Petite Marmotte was much like You Are. This is because I went with particular musical ideas that I really liked, developed them and almost completed them nearly several days before the piece had to be finished, only to then conclude that I would have to start all over and write something else instead. You Are was written after scrapping another piece for cello and piano accompaniment that couldn't be used for the event it was intended because the cello part was too difficult for the only cellist I could find to learn it in time. And I didn't know how well the pianist could sight read and play the piece who was to play other pieces for the wedding, but who would come on the evening before. So, I wrote a song instead for voice, guitar accompaniment and flute, which was a setting in which I could perform it myself and accompany a flutist friend, Renée, who I knew could pull it off in time for the wedding. Luckily, the specific instrumentation wasn't decided upon by the bride and groom, but was left up to me. So, It was okay for me to change it quite close to the deadline. Now, with Petite Marmotte, I didn't scrap the original ideas and start over because Nelly didn't like it. On the contrary, she thought the few ideas I gave her a sample of in the weeks while I composed it were quite nice. The reason why I went back to the drawing board and started all over with completely different ideas was because the piece had to be simple enough for her to eventually learn and play herself one day, and sooner rather than in three years. It was also agreed upon that I would give the piece its premier performance. Oh...did I forget to also mention that on top of this I was asked to compose the piece about three weeks before it was to be due? Talk about a time crunch! I think it's important to keep in mind that if one wants to be a good artist, then he should be able to handle the pressures of a deadline. So, despite the demands of the commission, I did in fact keep this in mind and accepted the task and all its challenges. Little did I know what lessons this first official commission of mine would bring. For certain is: out of the process of creating this one piece with only three weeks of time, two other pieces were, for a lack of a better word, “birthed” out of it. This is because I went back to the drawing board with this project not only once, but twice. I essentially scrapped the first piece to start a new one, only to realize once again when that second piece was nearly finished that I just couldn't make the piece with the ideas that were in it simple enough for Nelly to learn any time soon or for me to learn quick enough to perform. So a third piece was started and finished, which is the Petite Marmotte that now exists. And all this decision making to start a new piece, scrap it and start yet another piece happened just about 4 days before the piece was due. AAAAAH!!! Luckily it was due first only for her to hear and to see if it really suited what she was looking for. It was then a week later that we scheduled to have the performance when Jim finally would be present to hear it. That gave me time to then practice it. Now, you're certainly wondering what those other two pieces were like and what became of them. Both pieces still exist and I've simply set them each aside for another time. The first piece started when I sat down one day with guitar in hand and decided to record myself improvising some ideas onto my little voice recorder. What's that you ask?...“Why in the world would he compose a piece for piano by sitting down with a guitar?” Well, let's just say that the creative process for me doesn't always follow any rules. But the ideas I came up with are easily able to then be tweaked to be played on the piano. It's interesting though how something played on one instrument has a different mood or feeling that is expressed than when it is played on another. So, I managed to get the ideas onto the voice recorder and then play it back to translate it onto the piano. The piece starts with a gentle pattern of repeated sixteenth notes, which set its foundation in the key of Eb major. This repetition of sixteenth note chords, altered throughout the piece, is what lays its framework and doesn't actually stop until the very last few measures. It's almost like a broken record in a sense. This may sound funny when you think of it. But I find that a lot of music these days, whether Rock, Pop or even Modern Classical has this pulsating and repetitious “broken record” backbone found in it. I'm reminded mostly of the group, Coldplay, though when I play the piece with its oscillating “dim dim dim dim dim dim dim dim dim dim dim dim dim dim dim dim” that wields its way and takes shape throughout the landscape of the tune. The opening chord is an Eb Major triad with a suspended 6th, tightly clustered within the octave. Sparsely coloring this minimalistic pattern in the first several measures isn't a melody of any sort, but rather a few tones struck and sustained over several beats, like little beacons of light you may see at night to simply notify any overhead pilots of their presence, should they fly their planes too close. These beacon-like sustained pitches that are sounded every few beats or so were pretty much the exact opposite of the oscillating and ever pressing forward pulsations of their gentle sixteenth note accompaniment. “Petite Marmotte” is French, and it means, “little groundhog.” This music that I came up with truly does paint a picture of an almost Fantasia-like film that plays in my mind. I can see a little groundhog sleeping in his little hole as the camera pans in on him. It is dark and yet there is enough light to see him in his little home and recognize what he is and that he is there. The music continues with the gently pounding 16th note harmonies accompanying what is by then a clear melody. This melody, in my opinion, could easily have text adapted to it. And actually, do you remember how I told you that the ideas for this piece first came as I recorded myself on the guitar into my voice recorder? Well, I even sang an improvised melody with text over what I played on the guitar. In my mind, I was set on making a sort of “song without words.” That means I wanted to make something that could have text that would fit the mood and message of the piece, but isn't supposed to. The melody in itself should say everything needed to be said while the possible text would be left to the imagination. I remember though that the text I sang was something like, “Life away from you has been so hard.” I didn't come up with or write down any text to read off of before I recorded this stuff into the voice recorder. I just had the above mentioned line of text in my mind and I used it for the sake of having something to base and create a melody off of with its syllabic structure, pentameter and mood, even if the words that I came up with as I recorded and sang didn't actually make any sense. Eventually, the piece reaches a sort of development section that builds and builds with so much tension that you are quite satisfied when it resolves to the grand climax that represents the joy of the loved ones return. Now, although the piece was to be titled Petite Marmotte, its expressed emotions didn't necessarily have to have anything to do with its title. “Petite Marmotte” was simply an inside joke between Nelly and Jim, and Nelly was set on this being the pieces title. Now if you remember, I mentioned how I could imagine a Fantasia-like film going through my mind with a groundhog and all. I recall how I once saw or heard about the idea behind Walt Disney's Fantasia films and how the animations that were to accompany the music were actually not supposed to be a recreation of what the composer had intended to portray with the music. You often go to a concert and read in the program notes what the composer was thinking when he or she wrote the piece or what pictures went through their mind. But the idea behind Fantasia was to get into the mind of someone whose listening experience was never influenced by the program or liner notes accompanying the concert or music recording. One person may hear a particular piece of music and imagine something in their mind that is totally different than what the composer may have ever thought of. For example, whenever I hear the first movement of Naïve and Sentimental Music by John Adams, I envision one of these Fantasia-like films in my mind that would tell the famous story of the Wright brothers and their attempts to create a device that could transport humans through the air, which we of course now know as the airplane. Naïve and Sentimental Music's first movement is also of the same title and evokes this picture for me because of its whimsical melody that begins so gentle and light as a feather and which yet becomes at times monstrous, chaotic and almost violent, leaving me astounded at how it got there from where it began. For me, all this in the music creates a picture in my mind of how Orville and Wilbur Wright would get so close to finally achieving flight and then something would go wrong. My favorite part of the piece though is the very end where the music builds and builds and builds, almost to the point of madness with it's clanking percussive characteristics. Just picture yourself watching this movie that I'm imagining here; imagine you are right there with the Wright brothers. Everyone surely thinks the brothers are off their rocker with this whole idea of a flying machine. They've made many failed attempts that left them trying to figure out whether to continue or just give up. They go for it one last time. The plane is leaving the runway picking up speed. The music is getting more and more hectic as you're wondering where this spastic ride is gonna go. Suddenly the engine fails or some other part of the plane fails and the music gets more agitated and frustrated, wanting to resolve but not quite getting there yet because something is preventing it from doing so. The plane is still moving, but there is not much runway space left if they want to slow down. So, it's either up into the air or bust. They bang and pound on the hull of the plane, sometimes cursing and yelling in their frustration, for their reputation isn't going to get any better after this last attempt if all fails. Everyone is looking at them and thinking, “Those loonies have messed up again. Why don't they just give up already?” All seems ruined. But finally, the engine picks up again and they increase speed. Everyone is shocked when they see what happens before their very eyes. It's finally come true. The Wright Brothers are airborne. All their perseverance has finally paid off. The naysayers are eating their own words as history is made. At the very moment in the music when the wheels lose contact with the ground, the crescendo leads us to believe the orchestra has just lifted off and gone airborne too in all the excitement that it emits. Every instrument in the orchestra is shouting out in jubilation and ecstasy, the brass are punching away at Blastissimo (It's actually probably a fortissimo written in the parts for the orchestra at that point, but when listening to the recording, you'd think there was a performance note on the page instructing the players to play at a dynamic of “blastissimo”.) Listening to that part of the piece makes me feel like I'm right there in the cockpit, defying gravity and flying through the air, free as a bird, wind against my hair at however many miles per hour is necessary to reach such a lift. It's just amazing. Now, I don't know exactly how that attempt of Orville and Wilbur played out in real life as they finally succeeded. But that's how I imagine it would unfold in such a Fantasia film if one would ever be made; that's at least how it happens in my mind every time I hear that John Adams piece. So, as I was saying though, that's the kind of thing that happens in many pieces of music and what I was looking for in Petite Marmotte; I wanted something that could invoke a picture in the mind of the listener, whether or not it was necessarily that which the piece originally intended with its personal message from Nelly to Jim. One could even picture a groundhog wanting to come out of his dark little hole of a home and become exposed to the light of day and the excitement and wonders of the grand world out there filled with its unknown places just yearning and begging to be ventured into. The imagination should be free to conjure up whatever it may fancy. Anyway, this first attempt at constructing Petite Marmotte was just becoming more and more difficult for Nelly to eventually be able to play, in my opinion, due to its complexity. So, I bit the bullet and started over with something simpler. This time, I decided I would try at something strictly for two voice harmony: one voice in the right hand and the other in the left hand. This piece too eventually reached completeness. Yet it, just as I had found its predecessor so to be, was too difficult and complex for Nelly to learn any time soon. It was too “Bach-inventive” so to say and therefore had to be set aside for another day as well. Although, I did find that this second piece birthed out of my Petite Marmotte project would fit nicely in a setting not for piano, but rather as a duet for flute and bassoon. Or maybe even a duet for violin and cello. Its “counterpointiveness” suits a duet setting quite nicely with its melodic interweaving in and out through various tonalities. Yet, by this point it was only 3 days until I had to have the piece ready to present to Nelly, and I had already spent hours in the prior two weeks on the other two attempts at creating something musically appealing and yet simple enough for Nelly to eventually learn. Was there any hope in sight for my weary brain? But anyway, now you know a little about the process I went through when creating Petite Marmotte. It was, just as I said before, a very challenging and yet edifying experience for me as a composer to take on such a task and see it through just as any other composition I've written in the past and have yet to write. You can of course hear a recording I made of Petite Marmotte on my MySpace page, to which you will find a link under the “Venturlinks” tab as you scroll back up to the top of this page and look to the right hand side. The score is also available to purchase from my storefront at lulu.com, to which there is also a link under the “Venturlinks” tab. You can also find it on the “The Music/Storefront” page when you click the link with the same name at the top of this page in the menu. 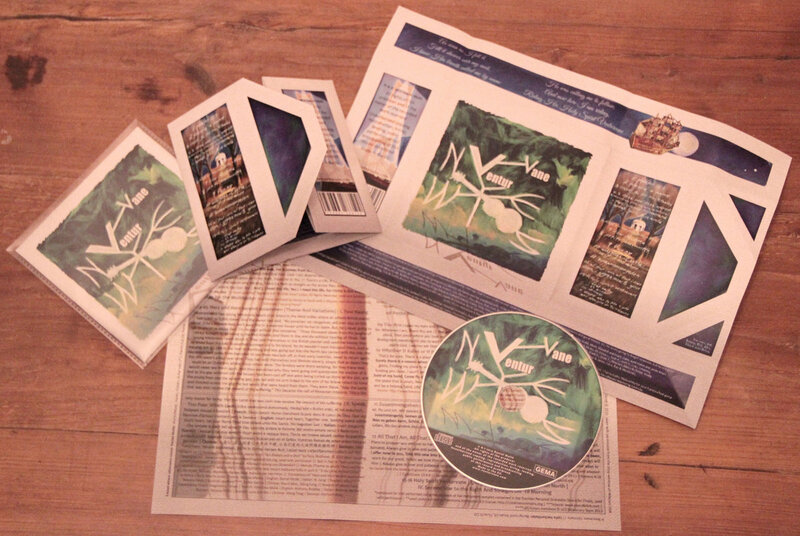 The recording of Petite Marmotte found on my MySpace page is also available to purchase on a CD titled Live The Venturvane (live collection)/ Petite Marmotte, which I compiled recently from a collection of various live performances. Petite Marmotte is the only piece on the CD that is not a live recording, except for the fact that I was very much alive when I recorded it. But that doesn't matter. What does matter is that it is also available to purchase if you'd like (and even still if you don't like) through my storefront with lulu.com. So, I hope you enjoyed reading this blog entry, as it's been a while since you've heard from me. I wish you all the best.